Why is Faella the Best Artisanal Pasta in Gragnano? After Camille’s enthusiastic report of her visit to Pastificio Faella, I couldn’t resist and decided I wanted to see the pasta magic, too. I went to Gragnano, thirty minutes from Napoli, the land of “O Sole Mio”. There was no sun, when I went; in fact, it rained all day. My sunshine was the warm welcome of the Faella family and all their friends. What I learned illuminated me! Between me and Camille, now we have gone to Gragnano three times; we talked to everybody in and outside of town; we did our careful due diligence. The final decision is: Yes! Pasta Faella is good enough to be imported and represented by Gustiamo in the United States! Evviva! 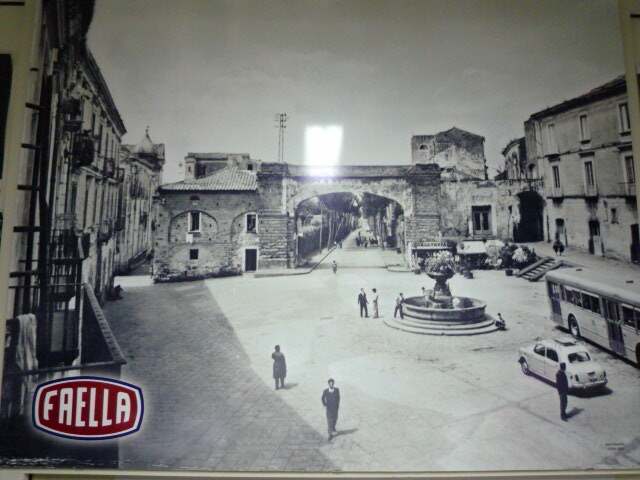 Gragnano is called “La Citta’ della Pasta” because its history of pasta making is 500 years old. Last century, every family would make pasta using the pure water from the local springs (it is still pure, with limited calcium content) and drying it in the streets, taking advantage of the warm breeze that would flow through the main road like a channel from the mountains to the sea. There are very few pastifici left in the center of Gragnano but they no longer dry the pasta in the streets, for hygienic reasons. Pastificio Faella is the only Pastificio left in the main square, Piazza Guglielmo Marconi. 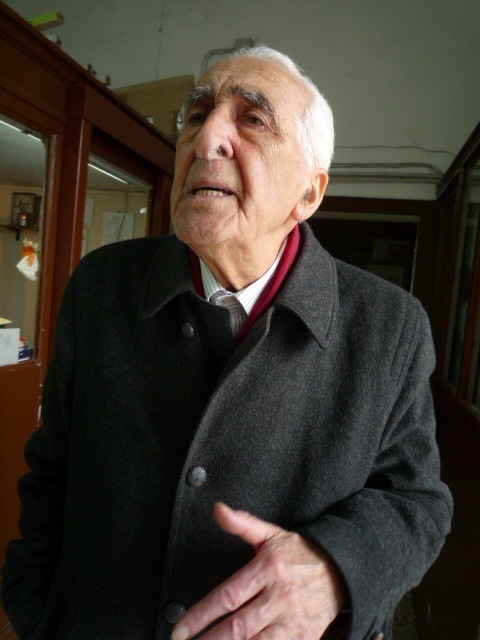 Don Mario Faella is the son of the founder, Gaetano, and he is 95 years old. Gaetano and his family moved to the current location of the Pastificio, in Piazza Guglielmo Marconi, when Don Mario was 4. He still lives on the second floor of the building with his wife who cooks pasta for him every day. Asked whether he likes any particular pasta shape or sauce, Don Mario replies, I eat everything, as long as it is my pasta. Don Mario, started to work in the pastificio when he was 10. His first job? Fullfilling the export orders to a certain Mr. Letterese, their distributor in NY at the time. He says it was a very tough job; his father wanted to discourage Mario’s passion in the family pastificio. Luckily, he did not succeed and Don Mario is still there. He goes to work (one flight of stairs down) every day and monitors the quality of the production with love and care. He told me with an authority and a passion I will never forget: LA PASTA VUOLE IL SUO TEMPO DI RIPOSO! (pasta needs its time to rest!) In fact, he believes that the drying phase is the most crucial and delicate in the production of pasta. Don Mario was happy to see me and wished me good luck at bringing his pasta to America. 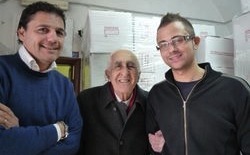 Kind, hard working and talented Sergio and Luca Faella, Don Mario’s nephews, are now running the Pastificio. They are the family’s new generation which will guarantee the company a good and long life. They have learned everything from Don Mario and can’t make mistakes. Don Mario is the soul of the pastificio and he is watching over Sergio and Luca’s shoulders. He always will! Long life to Pastificio Faella. And grazie! Previous Post Did You Say Nothing Ever Changes in Roma? Wrong! 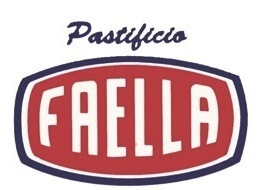 does this pasta Faella use local Italian wheat or imported wheat? how is it different from Latini pasta which grows its own wheat? grazie Ann, for your question. Faella uses durum wheat flour from a mill in Puglia. this mill is a very old and reputable concern where many artisanal pastifici buy their flour. the wheat that the mill uses is the best quality they can find in Italy and in Canada. Don Mario told me that it varies, depending of the quality of the offerings at any particular moment. some of the best italian pastifici, including the Martelli, use exclusively the wheat from Canada for their pasta. they believe that the quality and the consistency of their flour from canadian wheat is the best. there are many other factors that contribute to make artisanal pasta exceptional: the quality of the water, the bronze dyes, the drying process… every pasta maker has his/her own preferences. i’ll ask Don Mario and Sergio of Pastificio Faella to give us his thoughts on this topic and hopefully they will post their comments, too, here. in addition to Beatrice’s comments, in my experience, Faella’s texture is a little firmer than Latini which is easier to overcook. The taste is very similar, they both have a stronger “wheat-flavor” than any industrial pasta. We believe that Faella’s aroma is a little more intense. I hope this helps. Hello Ann, I have tried both paste, Latini and Faella, and while I don’t know their manufacturing or agricultural differences, I would say that while Latini is a really good pasta, Faella was perfect!! It was just right in the consistence, in the taste with the baked vegetables which I had mingled with it. It was a very delicate and delicious feast meal. Now that I tasted these great spaghetti, I am very curius about how the other varieties will be. I will try them by and by. Last night I have tried out the Bucatini for the first time from Faella – WOW, they were so great! I had Latini Bucatini before, and yes, those were outstanding as well, compared to Delvedere or De Cecco (which you can simply forget, they don’t play in the same league…). I made my own (vegetarian) version of a sauce all’ amatriciana (using Morningstar Farm’s Bacon strips, cut in slices and fried in butter with a fist-sized white onion (cut) and fresh garlic (not minced out of a jar! ), rounded up with a good San Marzano tomatoe passata. And what should I say – we were blown away! The sauce is great, and the wonderful Bucatini made the dish perfect. They had just the right consistence, the right thickness, the right taste – I fully recommend this Pasta! Can’ wait to try the other varieties as well. grazie!!! such a lovely note! i posted it on our facebook page, also. hope you don’t mind :). tell us about the other shapes, when you try them. i personally love the calamari with seafood. ahhh, but you are vegetarian. then, calamari with san marzano tomatoes. but use miracolo san marzano tomatoes. you’ll be astonished! ciao e grazie! OK, I am going to try that, but to be honest, I am sceptical. The price for my regular bottle of San Marzano is quite on the limit already (3.49), so in order to pay the triple price for it, the miracolo tomatoes must really be astonishing. We are going to take a loan anyway soon, so I am now able to make this extra order. Usually I would not have been able to afford such a price. Not everybody has a New York style income, other states have lower incomes and lower prices, but I assume your prices are New York prices for everybody. I am taking advantage of your free shipping offer for facebook friends, and I will also get a pack of the figs to serve on our Yule feast (Dec 21, by the way, not Dec 25). It is almost 12 years ago since I had last white figs (those also came from Italy), so I am quite curious about the offered ones. grazie! your package is on its way. do tell me what you think of the tomatoes and figs, when you try them. grazie mille!!! Nobody wants to use unsafe water for pasta and yet you said that “Every family would make pasta using the pure water from local springs.” I think there’s no assurance in terms of its safety because we don’t know and there might be someone who is making some unnecessary move in ruining the purity of the local springs. Hello there Barbara, we find that contamination problems are actually something you will find more often with industrial pasta producers than with the little guys like Pasta Faella. We assure you that Pasta Faella is 100% safe to eat. Pingback: Pasta from Gragnano, Citta' della Pasta!